Feeling prehistoric? Tuffy’s Dinosaur Collection are great big toys for giant long lasting fun. Designed for medium to large size dogs THESE DINO TOYS ARE REALLY BIG! They are more like an actual playmate. What's great about the Dinosaurs? 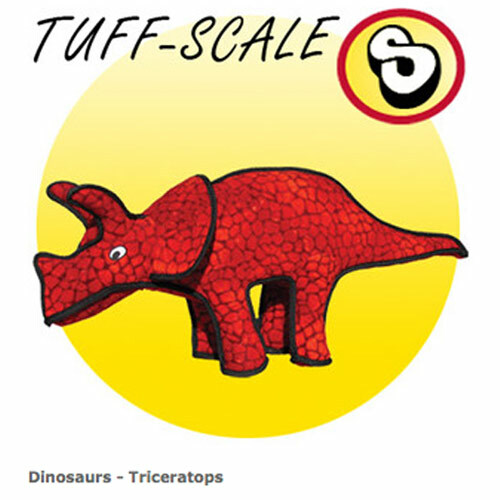 With multiple layers stitched together many times, Tuffy's Dinosaur Collection are some of the most durable soft toys on the market. However, if you have a super determined chewer then you should probably stick with our recommended Toys for Tough Chewers. No one likes to see a dinosaur meet early extinction! Super durability in a soft toy! Many layers of toy are bonded and sewn together to make one "Tuff" Layer. All seams are sewn multiple times. Most dog toys have just one seam while Tuffies sew webbing around the edges of the toy and then sew the edges together to reinforce their toys. 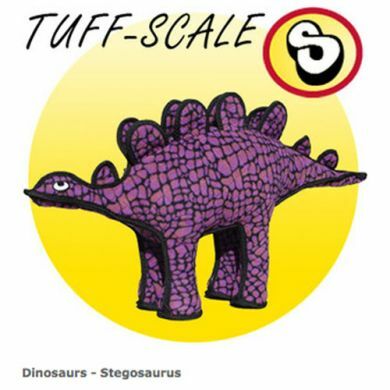 TuffyToys are stuffed with safe, non-toxic fiber. Warning: Your dog's safety is “Your” Responsibility. Tuffy Brand Pet Toys are designed to be play toys and NOT chew toys. While they are extremely durable, they are NOT indestructible. No Part of any toy should be ingested as injury may result. So please replace toy if torn or frayed.